Houston Students Are Heading Back — What They Find Could Change Schools Nationwide : NPR Ed Trauma-informed education and wraparound services are growing in response to the storm as Houston-area schools look to the future. The changes could serve as a model for schools nationwide. Belva Parrish, the counselor at Wilson and a 25-year veteran of Houston's public schools, says the pet update on the school's Facebook page was one small way schools can help students heal. "Trauma stems from not having any control of your situation," she says. "Banding together, being a place where students feel safe and they know they have a voice to be heard, will go a long way towards helping them." Harvey's toll on the nation's seventh-largest public school system, as well as schools around the region, was immense. In the Houston Independent School District alone, most school buildings took on some water, and dozens have major or extensive damage. Houston's public schools, which open beginning this Monday, Sept. 11, with rolling start dates, are nonetheless being positioned as a cornerstone of the recovery effort. "Schools have to be central to the recovery," Superintendent Richard Carranza told me. "One of the things all cities have are students." Leaders are positioning public schools as the place to address students' needs from the physical to the social and emotional. This is in tune with a growing emphasis, in districts across the country, on going beyond the strictly academic when thinking about the jobs schools must do. In its scope, Hurricane Harvey is being compared with Hurricane Katrina which struck New Orleans in 2005. But when it comes to education, the two cities are following very different paths post-storm. In the weeks after Katrina, a plan was hatched to close the New Orleans public schools, permanently. Seventy-five hundred public school employees were pink-slipped. Many were members of the African-American middle class and had deep roots in the city. The administration of President George W. Bush wrote a $45 million check directed specifically at charters, not public schools. Philanthropists gave millions more. New teachers came from out of town. The result was the nation's first all-charter school district. Hurricane Harvey struck under another Republican president, Donald Trump, who has strongly backed school choice, in a state with a Republican governor who has repeatedly cut budgets for public education. Houston's system is much bigger and hadn't been struggling nearly the way New Orleans schools were for decades prior to Katrina. And historical comparisons are always complex. Still, the contrast is notable. Instead of closing schools for months, Superintendent Carranza committed to reopening starting just two weeks after the storm, with two more rolling start dates in September. Students from the nine most damaged schools will be transferred elsewhere. He announced within days of Harvey that all students will be eligible to receive three free meals at school for the entire year. Breakfast will be served in the classroom or handed to students as they get off the bus; dinner will be available at after-school programs or packaged for students to take home. The district is giving out free school uniforms and holding a "Parent Summit" to connect parents to information, plus transportation, clothing and school supplies. And, instead of expanding charters, Carranza told NPR the city will be designating more "community schools" this year. Those are public schools with a particular mission to identify student and family needs for housing, health care, jobs, food and mental health, and to address those needs through partnerships with community-based nonprofits, government agencies and businesses. "Wraparound services is absolutely part of our strategic plan," Carranza told me in an interview. "Community schools are going to become an increasingly vital part of what we do." Within and alongside the community schools model, a central focus will be helping students recover mentally and emotionally from the trauma of the natural disaster. And here, too, there is a contrast with New Orleans a dozen years ago. Students returned to school in New Orleans after days and sometimes weeks in shelters far from home. More than 1,800 people lost their lives, and many more their homes — including closures of public housing — and their livelihoods. Thousands of families and extended families were separated by the evacuation. A higher level of mental, emotional and behavioral issues among children and teens is predictable after such a traumatic event. Yet many new New Orleans charter schools adopted a "no excuses" discipline model. Students were made to "walk a line" of tape in the hallways and to maintain absolute silence in classrooms — policies that, some students told me, reminded them of prison. The use of exclusionary discipline such as suspensions and expulsions became a citywide political issue. The state repeatedly found that at some schools, special education students were being illegally punished instead of receiving needed services. Paulette Carter, president and CEO of the Children's Bureau of New Orleans, a mental health agency for kids and families, has 20 years of experience in New Orleans schools. She says "no-tolerance discipline" can "exacerbate" the impact of trauma. "We need to shift the frame through which educators are looking at this, and bring empathy into the picture." These days, schools around the country, including some in New Orleans, part of a collaborative Carter coordinates, are talking much less about "zero tolerance" or "no excuses." Instead they are discussing "restorative justice" and "trauma-informed education." Restorative justice seeks to strengthen school bonds of inclusion and trust. Trauma-informed education seeks to address the root causes of acting out, including the emerging brain science of trauma and resilience. While still enforcing accountability for behavior, Carter says, a "trauma-aware" teacher tries to help students identify their triggers and build skills for managing emotions, and understands that sometimes, "that kid had a bad day and you need to give them a little bit of room to calm down." As it happens, before the storm, Carranza announced a big restorative justice program for this school year. And, last year, Houston schools staff took part in professional development on the basics of trauma-informed education. "It was in hindsight a very wise investment," Carranza says. Belva Parrish, the Wilson Montessori counselor, says the training will aid the teachers at her school in spotting the different ways children's stresses may show up in the classroom. "Excessive daydreaming," she lists. "Not getting enough sleep because they're having nightmares, so sleeping in class. You see a flat affect on the face. Or anger — acting out can often be a result of trauma." For all of it, she says, "our teachers are our front line." A front line that, in many cases, is going through the same things as the students. Parrish says that since she's the school's only counselor, and the sole mental-health professional for 600 students, some triage will be needed. "I've identified the kids at the school who have experienced trauma and I will start with them, because this could be compounded trauma for them," she says. Carranza says the district will be tapping both public and private funding sources to hire more school counselors. "My philosophy is, you can never have too many." There is a reason Carranza talks about private donors and partnerships to address wraparound services and mental health. School budgets in Texas have been cut $5 billion in recent years, and districts sued the state for more money in a case that went to the state Supreme Court last year. Spending per student in the city is 37 percent below the national average, we reported last year. "I think Houston ISD has been pretty aggressive in trying to get funding," from outside sources, Carranza says. Houston's schools rely primarily on local tax dollars, and that tax base is obviously going to be stressed, maybe for years to come. 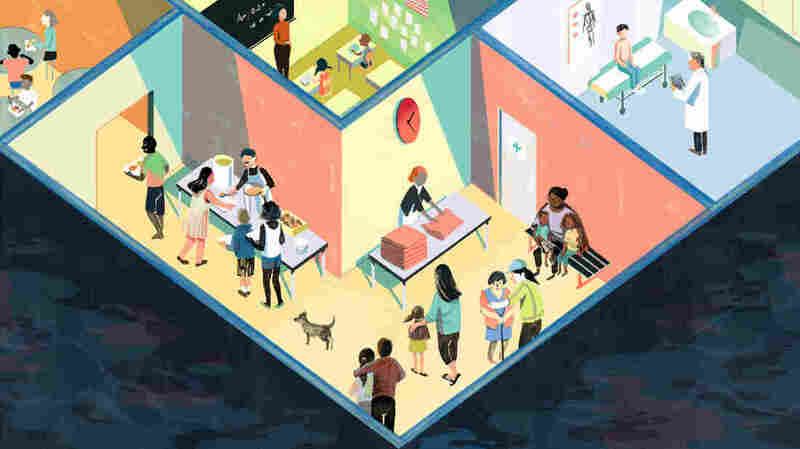 As federal and state relief packages take shape for communities hit by Harvey, along with philanthropic dollars, it remains to be seen what be will included for education, or what strings may be attached. In the meantime, educators like Parrish are marshaling inner strength. "What we plan to do is get the students active in projects that will help the community," she says. "They can feel some empowerment by doing that." Even before school started, the parent-teacher association was calling for volunteers to help sort donations for district students and staff. And just as important, Parrish says, is "always emphasizing the positive things they have in their lives, the love of their family."